Well.........the other day, I was having a psychologically interactive session with myself (don't think I'm one of those mad people who talk to themselves more than they do to others, it's just that I was having a tete-a-tete with my inner self regarding my achievements in life so far) ........and I suddenly realized that there are so very few things in my life that makes me feel that I've done something worthwhile! And simultaneously I could think up of a million things that I'd have loved to do.......& which would have made me feel like I've lived life completely!!! That whole soul-searching sort of shook me up & I decided to plot & plan my way of doing at least some of those things which'll make me smile on my deathbed & say that "Yes! I've lived!" 1. Going to visit the Pyramids of Egypt. 2. Going trekking with friends to some obscure Indian hills. 3. Buying a Chanel suit, a Louis Vuitton bag, Jimmy Choo shoes & an Hermes scarf. 4. Being a well-known stylist. 5. Taking some time off from friends, family & work and going on a trip to some little-known place......all alone. 6. Creating my own personal library & filling it up from floor to ceiling with books, books & more books. 8. Buying a high-end digital SLR camera with full set of lens & clicking some out-of-this-world pictures with it. Even exhibiting my best shots in India & abroad. 10. Travelling to each & every nook & cranny of the world and learning about all the different places & cultures. I had to go visit my brothers & sisters-in-law today who've come down from Bangalore for the festivals..........so, I dressed up casually for a fun day out with family!!! I love the gathered balloon sleeves of the top, the boat neck & the pretty print on it.......the silhouette is super comfy & looks perfect with drainpipe denims. During my college days, I used to be a die-hard believer in hoops........I had hoop earrings in all sizes, colors & materials..........I still find hoops very versatile, since they go with almost all kinds of looks & outfits..........and this silver one is a personal favourite of mine. The green accessories were put on to compliment the green accents of the top. This bag is one of my fav picks from Bangkok........in fact, I was so besotted by this cute bag that I picked it up in 5 different colors!!! 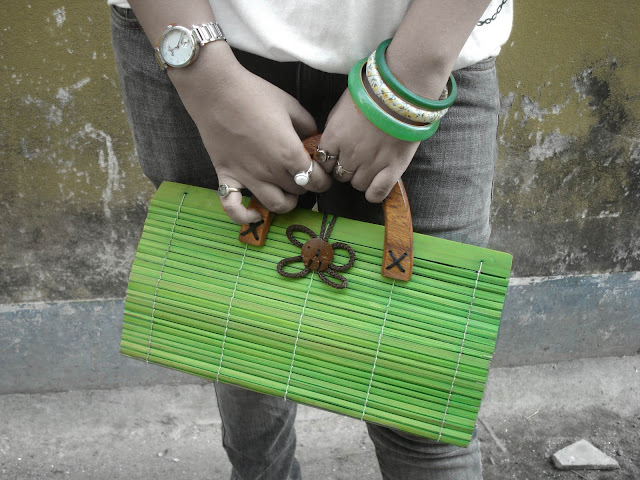 This is one of my favourite shades of green........specially when it comes to accessories, this color makes it's presence felt instantaneously & fashionably. These snakeskin shoes are perfect for both casual and corporate looks..........not to mention smart & stylish! Well.....that's all for now people.........do pour in your must-do-before-I-die list.........waiting to hear from you all!!! Till next time, stay stylish! I just love your bag and shoes..And that shade of green is my personal favourite too ..So, I may be a bit biased..:) Where did you buy those gorgeous shoes? :) Hope you had a fun tiem catching up with your family! Love love the splashes of green. Very very nice, love the first pic and those shoes are amazing! I like the green bracelet, purse, shoes, and smile (LOL). Green looks really nice on you. seems like a fabulous time. i love your bag . and wow , it matches your shoes !